My Mom is the best at letter writing. Often it's a thank you note but many times it's also just a hello, how's it going or thinking of you message. It's thoughtful and kind and personal and I've kept many of them over the years. I've also had a few friends who are awesome at writing notes or letters and really make an effort (specifically Paolo and Kelly Rae). It matters and it gets noticed - especially these days where it's so easy to send a text message or some other technical correspondence. 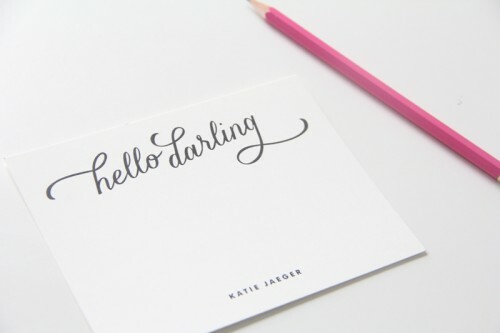 Jotting out a few kind words to let someone know you are thinking about them is just cool. 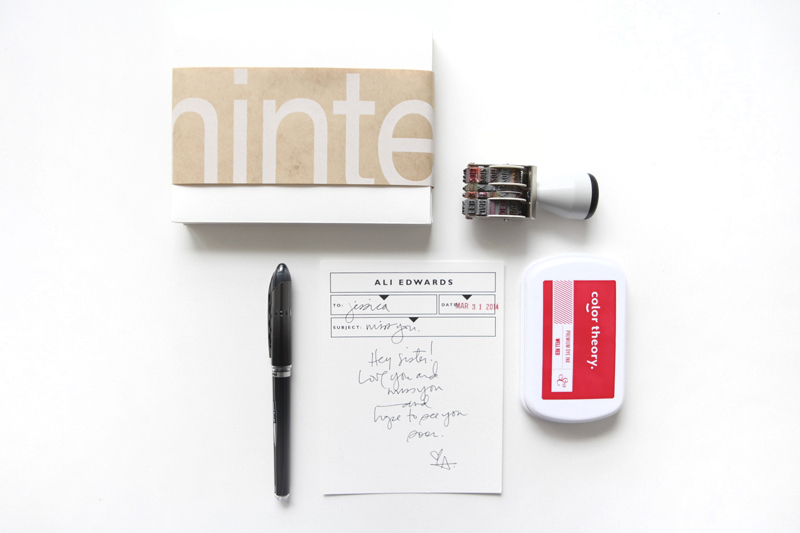 There's even a TED talk on the lost art of letter writing. And you know I loved how she talks about the legacy of handwriting. Today we're sharing the two pieces of personalized stationary we recently received from Minted as part of their 6th Birthday Celebration. We've partnered with Minted in the past for Christmas cards and wall art and we're big fans of their quality and service. Katie picked the Hello Darling package and I went with the Chic Memo set. We both went for simple black and white designs but there are color options available as well. ONE | Have your stationery out and available. It's kind of like my sewing machine. When it was put away I barely ever used it but once I had it out and more accessible in my office it gets used all the time. TWO | Have a pen you love. My favorite everyday pen is a Uni-ball Vision Elite. THREE | Know that just a short note is perfect. It doesn't have to be a novel or something extravagant or a special occasion or perfectly crafted. Just a simple hey, you crossed my mind today can be all that's needed to lift someone's spirits or brighten their day. FOUR | Pick up some fun stamps. My personal favorites right now are the ferns and the vintage seed packets (both are forever stamps). Do you guys write letters or receive letters from someone special? 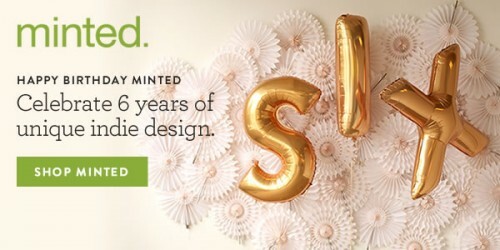 Minted is celebrating 6 years of unique indie design with a very big sale. 15% off everything - including limited edition art and custom art for kids & adults. Sale runs from today until April 8th. Me too. I want in too. Bummer. :) I like that! That's nice. I love to get letters and I mean to write letters, but somehow I never do. Part of that reason is that I don't have a dedicated place (uncluttered) to sit down and write and I don't have my stationery/note cards/address book/stamps nearby. So I don't see them to remind me to take a moment and if I do think about it, I think I have to have reams of time to write a really newsy letter since it's been so long and so on and so on.... So nothing gets written. Thanks for the reminder, both to do it and to have the supplies handy to make it easy and convenient! My OLW this year is HEART. As part of having an open heart, a thoughtful heart, a kind heart, etc, one of my actions is to write a letter, note or card once a month to someone just for the heck of it. I have LOVED the feeling I get when I've written to someone this year! And I LOVE stationary! I use to spend so much time in the stationary sections at stores perusing the options. I miss writing letters and I miss getting letters in the mail, and I have loved sending letters in the mail this year. It does make a difference to have stationary and a pen that I love to motivate me to write. So I'm off to see what Minted has to offer! Love this post! The effort it takes to send a note is comparatively little to the effect it has on the recipient. I keep all of my stationary stuff in an Ikea box next to my craft table and love putting notes together. Last year, my resolution was to always send a card. I used to waver on sending cards, especially in difficult times when I didn't know what to write and didn't think what I wrote could help someone going through a difficult time. I realized the act of sending something will matter more to the person than what I wrote and my difficulty finding the words was dwarfed by what they were going through. I write letters occasionally. Actually, I want to write letters more. My closest friends I met through letter writing, and one still writes me fairly frequently. I'm just not great at replying these days. Have you read Alexandra Stoddard's Gift of a Letter? That book is very inspiring towards writing letters. One of my New Year intentions for 2014 was gratitude letters. I think writing a letter that focuses my mind on the people blessings in my life has to be equally as uplifting as receiving a letter. I write a letter every Wednesday to three of my friends. Sometimes it is just a weekly recap, sometimes a postcard or even just a web site or link to a YouTube video scrawled on a piece of scratch paper I throw in an envelope. I know how much they appreciate the communication, however small, each week. I Love to write letters. Every other week, I send one to my husband's gramdma. I also love that she writes back! I also try and a send out three to four other letters/postcards/cards a month to a variety of people. As stated by others, just a quick hello or thank you brings enjoyment to those that receive it. I am always looking out for cute stationary and cards to send. It doesn't really take much time & to me I make it a priority to write them. Minted makes such adorable items! Love this post and well, really anything stationery related. I love to write and I love to send and get snail mail. Even so, I had a hard time sitting down and writing so I set a goal for myself last year to send the equivalent of one piece of snail mail per day of the year. Some months I sent more than 30 pieces and other months I sent fewer but by the end of the year I had sent 365 pieces of snail mail. It was so fun for me and the recipients were amazed, grateful, pleased and happy to receive a piece of mail....with a stamp on it.....in their mailbox!! I highly recommend it! That is a good idea of letter writing. This kind of small letter writing would make the person who receive more happier than sending a message through technical support. I really loved your idea. Such a great change in the window to set the setting that will be on the http://windowstuts.net/default-search-engine and you may change the setting that will help the default setting.